Judging by the date on it, Kepler-452b would be my guess. Kepler has discovered hundreds of systems with multiple transiting exoplanets which hold tremendous potential both individually and collectively for understanding the formation and evolution of planetary systems. Many of these systems consist of multiple small planets with periods less than ~50 days known as Systems with Tightly-spaced Inner Planets, or STIPs. One especially intriguing STIP, Kepler-80 (KOI-500), contains five transiting planets: f, d, e, b, and c with periods of 1.0, 3.1, 4.6, 7.1, 9.5 days, respectively. We provide measurements of transit times and a transit timing variation (TTV) dynamical analysis. We find that TTVs cannot reliably detect eccentricities for this system, though mass estimates are not affected. Restricting the eccentricity to a reasonable range, we infer masses for the outer four planets (d, e, b, and c) to be 6.75+0.69−0.51, 4.13+0.81−0.95, 6.93+1.05−0.70, and 6.74+1.23−0.86 Earth masses, respectively. The similar masses but different radii are consistent with terrestrial compositions for d and e and ∼2% H/He envelopes for b and c. We confirm that the outer four planets are in a rare dynamical configuration with four interconnected three-body resonances that are librating with few degree amplitudes. We present a formation model that can reproduce the observed configuration by starting with a multi-resonant chain and introducing dissipation. Overall, the information-rich Kepler-80 planets provide an important perspective into exoplanetary systems. Tommi does seem to be right in that the densities given in table 5 are miscalculated (underestimated). They seem to be underestimated by factor 1.46-1.48. Also looks like this is in tables 3 and 4, which indicates that there is some kind of unit conversion error going on and it isn't an artifact of correlations between the variables. The Kepler Mission has discovered thousands of exoplanets and revolutionized our understanding of their population. This large, homogeneous catalog of discoveries has enabled rigorous studies of the occurrence rate of exoplanets and planetary systems as a function of their physical properties. However, transit surveys like Kepler are most sensitive to planets with orbital periods much shorter than the orbital periods of Jupiter and Saturn, the most massive planets in our Solar System. To address this deficiency, we perform a fully automated search for long-period exoplanets with only one or two transits in the archival Kepler light curves. When applied to the ∼40,000 brightest Sun-like target stars, this search produces 16 long-period exoplanet candidates. Of these candidates, 6 are novel discoveries and 5 are in systems with inner short-period transiting planets. Since our method involves no human intervention, we empirically characterize the detection efficiency of our search. Based on these results, we measure the average occurrence rate of exoplanets smaller than Jupiter with orbital periods in the range 2-25 years to be 2.0±0.7 planets per Sun-like star. Generally it appears that the occurrence rate for long-period giant planets is lower than the rate for smaller planets, which mirrors the situation for shorter periods. While the population of long-period giant planets is reasonably understood from radial velocity surveys, the corresponding small planets are currently out of reach. Kepler and microlensing will likely provide the only view of such planets for some time. The Robo-AO Kepler Planetary Candidate Survey is observing every Kepler planet candidate host star (KOI) with laser adaptive optics imaging to hunt for blended nearby stars which may be physically associated companions. With the unparalleled efficiency provided by the first fully robotic adaptive optics system, we perform the critical search for nearby stars (0.15" to 4.0" separation with contrasts up to 6 magnitudes) that dilute the observed planetary transit signal, contributing to inaccurate planetary characteristics or astrophysical false positives. We present 3313 high resolution observations of Kepler planetary hosts from 2012-2015, discovering 479 nearby stars. We measure an overall nearby star probability rate of 14.5\pm0.8%. With this large data set, we are uniquely able to explore broad correlations between multiple star systems and the properties of the planets which they host, providing insight into the formation and evolution of planetary systems in our galaxy. Several KOIs of particular interest will be discussed, including possible quadruple star systems hosting planets and updated properties for possible rocky planets orbiting with in their star's habitable zone. This work was undertaken as part of the Kepler Habitable Zone Working Group. 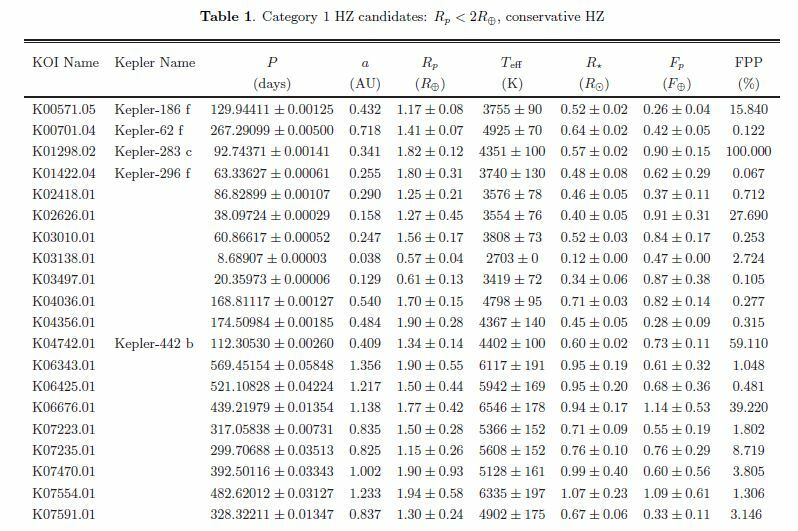 We use a variety of criteria regarding HZ boundaries and planetary sizes to produce complete lists of HZ candidates, including a catalog of 104 candidates within the optimistic HZ and 20 candidates with radii less than two Earth radii within the conservative HZ. It’s an important paper with new mass measurements by HARPS-N of three of the five planets. Kepler-20b is a rocky world with a 1.8 earth radius (density 8.2) : new record ! We report on the discovery of a planetary companion candidate with a minimum mass Msini = 4.6 M_J orbiting the K2 III giant star HD 175370 (KIC 007940959). This star was a target in our program to search for planets around a sample of 95 giant stars observed with Kepler. This detection was made possible using precise stellar radial velocity measurements of HD 175370 taken over five years and four months using the coude echelle spectrograph of the 2-m Alfred Jensch Telescope and the fibre-fed echelle spectrograph HERMES of the 1.2-m Mercator Telescope. Our radial velocity measurements reveal a periodic (349.5 days) variation with a semi-amplitude K = 133 m/s, superimposed on a long-term trend. A low-mass stellar companion with an orbital period of ~88 years in a highly eccentric orbit and a planet in a Keplerian orbit with an eccentricity e = 0.22 are the most plausible explanation of the radial velocity variations. However, we cannot exclude the existence of stellar envelope pulsations as a cause for the low-amplitude radial velocity variations and only future continued monitoring of this system may answer this uncertainty. From Kepler photometry we find that HD 175370 is most likely a low-mass red-giant branch or asymptotic-giant branch star. We conduct a uniform analysis of the transit timing variations (TTVs) of 145 planets from 55 Kepler multiplanet systems to infer planet masses and eccentricities. Eighty of these planets do not have previously reported mass and eccentricity measurements. We employ two complementary methods to fit TTVs: Markov chain Monte Carlo simulations based on N-body integration and an analytic fitting approach. Mass measurements of 49 planets, including 12 without previously reported masses, meet our criterion for classification as robust. Using mass and radius measurements, we infer the masses of planets' gaseous envelopes for both our TTV sample as well as transiting planets with radial velocity observations. Insight from analytic TTV formulae allows us to partially circumvent degeneracies inherent to inferring eccentricities from TTV observations. We find that planet eccentricities are generally small, typically a few percent, but in many instances are non-zero. Interesting to see some progress in physical parameters determination for Kepler planets. On the other hand for unknown reasons EPE seems refusing to list 15 confirmed Kepler planets (from Kepler-97 to Kepler-434 b). Looks like all the planets at Kepler-445 are a bit smaller than we thought. All of them are consistent with being rocky planets. From the abstract, it's an Earth-sized planet with Venus-like insolation orbiting a nearby M5V star. Schmitt, Jenkins & Fischer "A Search for Lost Planets in the Kepler Multi-planet Systems and the Discovery of the Long-period, Neptune-sized Exoplanet Kepler-150 f"
So, did you think that the ~5.3 AU binary at KOI-1257 (Kepler-420) was rather close for an S-type planet? Gajdoš et al. "Transit Timing Variations in the system Kepler-410Ab"
The primary star has a mass of 1.214±0.033 solar masses. Kepler-410Ab is a Neptune-size planet on a 17.8-day orbit. There is a red dwarf at around 250 AU from the primary, the orbital period would be too long to cause the TTV. The perturbing object appears to be in a ~970 day orbit. Two different methods of deriving the properties of the companion give different results. LITE gives a mass of 2.151±0.078 solar masses, which given the photometric constraints would make it most likely a near-equal mass, non-eclipsing binary. This would make Kepler-410 one of the few known planet-hosting quadruple systems On the other hand, the Agol et al. (2005) methods gives a lower mass of 0.906±0.155 solar masses. Using Kepler's 3rd law, for the high-mass case, the semimajor axis of the companion is 2.88 AU. For the low-mass case, the semimajor axis is 2.47 AU. Surprisingly, no systematic spectroscopic observations of this system are available to this date. In 2016, we started a low-dispersion spectroscopic campaign using a 60-cm telescope (Pribulla et al. 2015). Preliminary results suggest radial-velocity variations of Kepler-410A. For a definitive answer, we plan an observation program for high-dispersion spectroscopy of Kepler-410. Using the broadening-function method (Rucinski 2002), we want to investigate the clues of radial velocities of any potential additional source. I don't think this is right at all. The authors assume that the TTVs are due to a light travel time effect, but they have not even considered the existence of resonances, which are a far more plausible cause for the TTVs. In analogy, the authors here would suggest that the TTVs of Kepler-9b indicate an object is orbiting Kepler-9A with a period of about 1000 days. As this third body goes about its orbit, the position of Kepler-9A would move in response, causing the distance between the observer and the star to move, causing the TTVs. The third body would have a mass of several solar masses. This is not true. The actual cause of Kepler-9b's TTVs is Kepler-9c; as they are in a not-quite 2:1 resonance, their mutual gravitational attractions add up constructively, resulting in TTVs over a timescale much longer than their own orbital periods. This can happen for many sets of resonances, with closer ones resulting in stronger TTVs. For Kepler-410Ab, it is far more plausible that there is a non-transiting planet in a wider, resonant orbit. This is not far-fetched - Kepler has shown that multi-planet systems are common, and that resonances are common. Additionally, the transits of b are fairly grazing (the impact parameter is 0.8 ), so it is likely that a more distant planet would not be transiting. Though it is probably not possible to calculate the orbital period of such a perturber because the TTVs have a low S/N, the perturber would at least not have to be massive to produce such small TTVs. A resonance provides a much more probable explanation for the TTVs here, and there is no need to a less plausible, planet-formatiom-theory-breaking cause in this case. In the discovery paper, 3 low-precision RV measurements are given in table 2. These span 800 days and are compatible with a constant RV, strongly ruling out the km/s-scale variability implied by a stellar companion on such a short orbit. 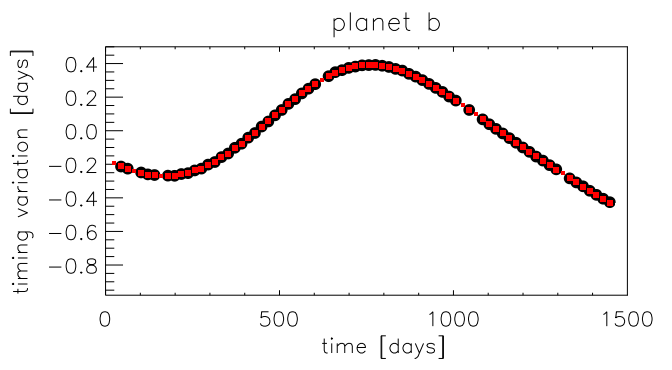 Kepler-560 is found to be binary, and while it isn't clear which star the planet orbits, the primary is favored. A companion star is found at KOI-1725 and KOI-2453. They're unable to statistically confirm the planet candidate around the latter (FPP = 3%). They do valdiate the planet candidates orbiting KOI-1702 (FPP = 8.7 * 10-6) and KOI-1725 (FPP = 4.8 * 10-6).